An elegant sprawl of sparse, pristine landscapes and urban bustle, Oman is a shining example of the kind of diversity the Middle East is famous for. Once something of an enigma in the travel world, Oman has begun to make a reputation for itself as the cultural alternative to Dubai, where the age-old traditions have yet to be swamped by development and industry. You’ll find classic souks, unspoiled beaches that fringe the coast and vast golden deserts that seem to never end. 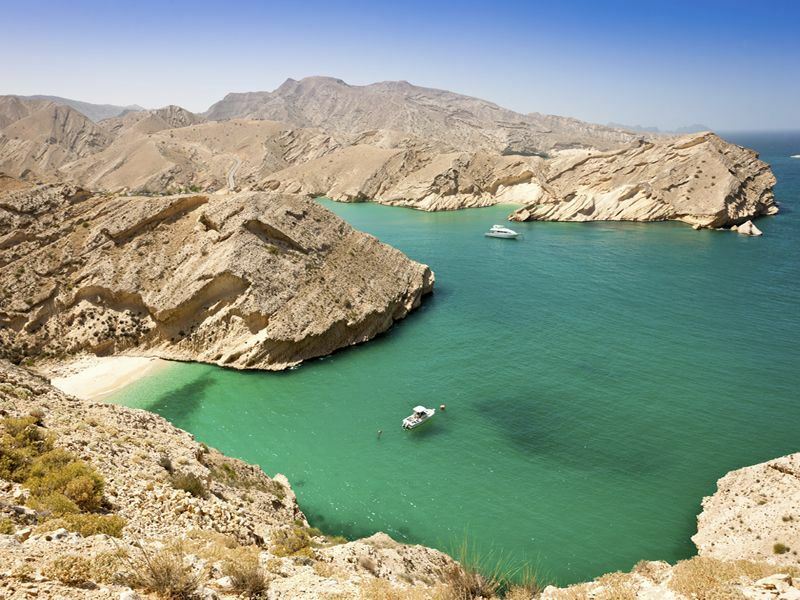 Here’s our list of the top 10 things to do in Oman. Arguably the most famous landmark in Oman, the Grand Mosque is truly a sight to behold. The only mosque in the country open to non-Muslims, this imposing example of elegant grandeur sits amongst a walled compound that’s guarded by four minarets. Inside, the décor is utterly breath-taking. Boasting an opulent main hall, expansive prayer hall and a 14m-tall Swarovski crystal chandelier, to name just a few of the extravagant features, this is luxury that’s completely unmatchable. A magnet for culture and arts in Oman, the Royal Opera House is a contemporary fixture in Muscat that houses far more than just an auditorium. This vast building has a concert theatre, pretty landscaped gardens, gourmet restaurants and a cultural market for shopping. For fans of the arts, it’s a must see. The design is every bit as awe-inspiring as the performances held here. The coast of Oman is lined with stunning soft sand beaches, ideal whether you’re surfing the waves or lounging on the shore. The Qantab beach is popular for fishing excursions and boat rides, where you can explore the coast from a different angle. Qurum beach is better suited to laid-back picnics and seeking out the secluded, palm-shaded areas. Often overlooked thanks to the lack of signage, Wadi Al Arbaeen is well worth the effort of off-roads and map reading. Completely serene and a haven for nature lovers, spend time exploring the rugged terrain and taking a dip in the pools. The picturesque capital, Muscat, has a charm that’s all its own. This famous port is quite unlike anywhere else in the Middle East, showing that past and present can reside harmoniously. In keeping with tradition, your first stop here should be the souks though. This chaotic hub is intoxicating, where you can browse local crafts, eat traditional food and purchase unusual artefacts. Head to the gold souk or haggle for souvenirs. It may not be your first thought for dolphin watching, but Oman homes a surprising array of whales and dolphins in its waters. From humpback, blue and sperm whales to spinner dolphins, these fascinating creatures are breath-taking in real life – a real highlight of your visit to Oman. No visit to Oman would be complete without a trip to the desert. The name is synonymous with this landscape. The wave-like dunes and rich golden hues of the arid scenery create a compelling backdrop for safaris – specifically, taking off across the desert in a jeep and experiencing a true Oman. Go camel riding, seek out the famous wadis and canyons, or have a picnic in the middle of the rippling sand dunes. Trace history and absorb the culture in some of Oman’s best museums. Bait Al-Baranda offers up a series of interactive displays and exhibits, housed in a renovated 1930's house. Kids will love this place, from the striking displays to the imaginative way in which they’ve made history enjoyable. Likewise, Ghalya’s Museum of Modern Art is a recent addition to the cultural scene, telling Oman’s story from 1950 to 1975 through a series of art, inventions and artefacts. Gradually gaining on Egypt as one of the top diving spots, Oman is a fantastic place to explore the seabed and experience the wealth of tropical marine life here. Whether you’re new to diving or an experienced pro, there are a number of spots that serve as a fitting location for this underwater activity. Translating as ‘Sun Mountain’, Jebel Shams is Oman’s answer to the Grand Canyon. You can’t beat the views from this jutting mountain, which offers up from awe-inspiring vistas. It’s the highest point in the country and popular for sightseeing - although it’s a bit of a drive from Muscat, you really won’t be disappointed once you arrive. A traditional country with surprising diversity, Oman provides a breath-taking backdrop to a wealth of authentic experiences. Fusing a captivating heritage with contemporary luxury, it’s a destination that will keep you returning.